Giving to the needy is always something that should be seen as positive, regardless if the giver belongs to the upper class of society or from the hard-working middle class. 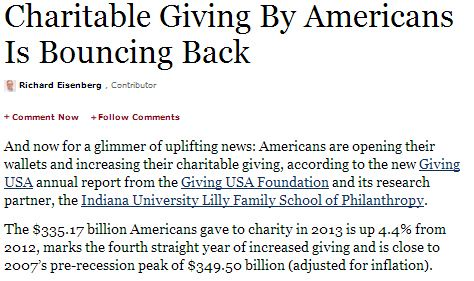 Americans have increased their donations to various non-profit charitable institutions in 2013, based on a report by Giving USA Foundation. The donations came from people from different economic backgrounds, including a sector that is still reeling from the recent economic turmoil in the country. The Blackbaud report also said that just 10% of boomers plan to give more to charity over the next 12 months. (By contrast, 21% of Millennials and 18% of Gen X’ers intend to boost their giving.) Blackbaud’s Dennis McCarthy told me, for an earlier Next Avenue post, that the percentage is low because so many boomers were “absolutely eviscerated” in the recession — their retirement funds took a hit and some lost their jobs. Osili agrees. “Keep in mind that boomers are facing retirement or are about to retire,” she said, so many may be cautious about giving more in the year ahead with retirement security on their minds. In cities like New York where there are several ways and opportunities to give, baby boomers, and other people who are really keen on sending help to charities but are struggling to do so, can find other alternatives, one of which is making a car donation in New York. Taking this route is an excellent way of helping out your favorite charities without really taking too much impact on your finances. This is perfect for households that have a car, an SUV, or any other vehicle that is no longer being used and is just collecting dust in the garage. Before deciding to donate your car in New York, you must first select the right group that is capable of helping you the moment you move your car from your house and maximizing its value. Generally, groups like Miles Ahead Donation, for example, take in different types of vehicles and convert them into cash, which will then be donated to the donor’s non-profit of choice. Go for a company that accepts practically all types of vehicles, regardless of their current condition. Next is to pick a group that has ties with several charities and non-profits representing various causes and initiatives. This will help increase your chances of finding an institution you would eagerly want to help and support.